The problem with being a gearhead is that it occasionally mixes quite well with a hoarder mentality. This seller is no exception, having amassed a collection of at least a couple dozen bikes, and they’re all for sale. The great thing about bikes, you can fit a whole lot of them in the same space as just a single car. If you have a single car garage, you could park at least half a dozen bikes in there. Collector-grade motorcycles tend to be less expensive, and usually better cared for in general, than their car counterparts. This is your opportunity to start your own moto collection. In one fell swoop, with one certified check, you could take home a trailerload of great ubiquitous Japanese motorcycles. 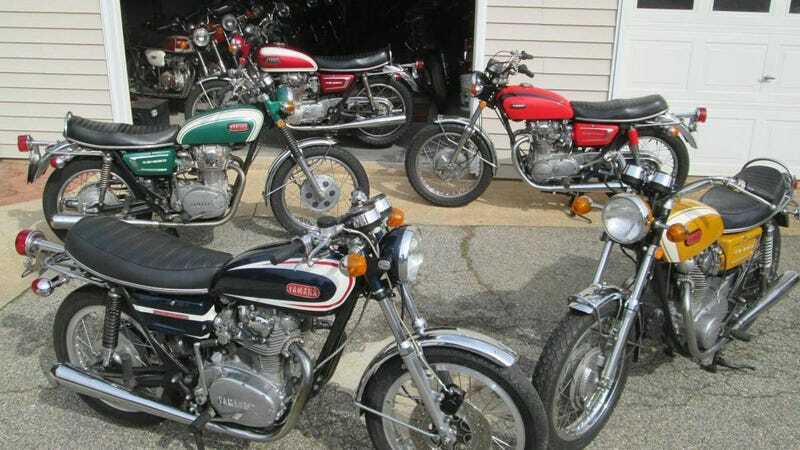 While most of the collection is comprised of vintage Honda or Yamaha bikes, you can see the odd Royal Enfield, BSA, or Kawasaki leafing through the photos of this strange Craigslist ad. Located somewhere in mid-Deleware is this little treasure trove of motorcycle history. If you’re looking for something Japanese, aircooled, and carbureted, with an upright riding position, mid-controls, and a traditional silhouette, chances are this seller has what you’re looking for. In an alphanumeric string that looks like the code behind the Matrix, the seller has listed each of the bikes they have for sale. Here is the list, as near as I can make out. This Craigslist ad can be found here, and bikes start at around $2100 each. If the 57 listed bikes are indeed all available for purchase, maybe you could bundle them all together and offer the guy a couple hundred grand to start your own two-wheel collection. Of course, you’d need a place the size of the Barber Motorsports Museum to house them all.